The Green Phone Booth: Reuse It Like a Rock Star - Grocery Edition. You've got a clutch of canvas shopping bags. You pack a mean waste-free lunch. 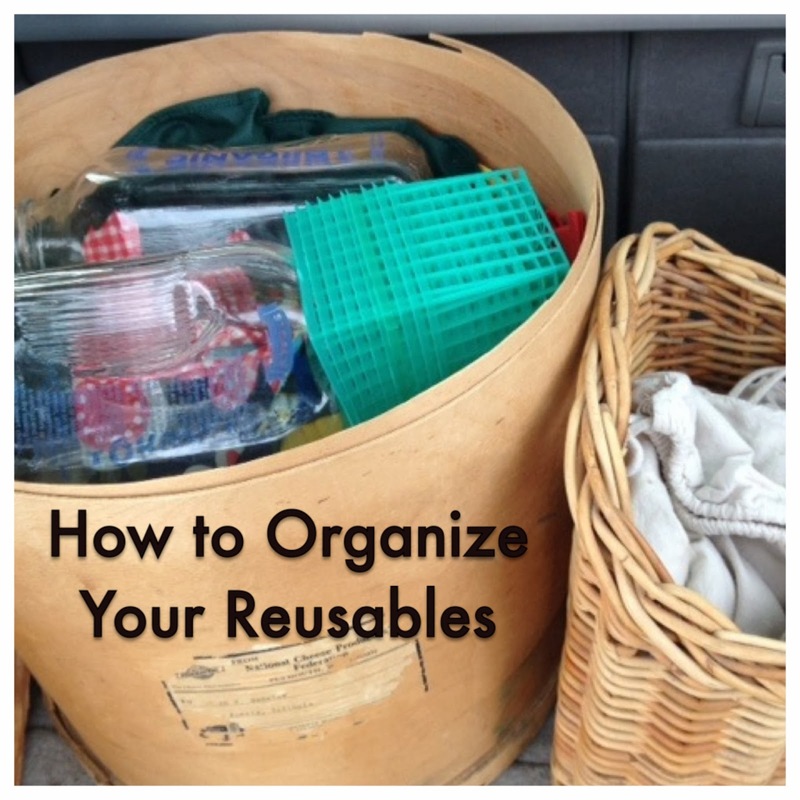 You want to reuse but also to avoid being featured on an episode of Hoarders. You, my friend, are ready for the next level. You are ready to reuse it like a rock star! Serial re-users know that the key to reusing is making it somebody else's problem. 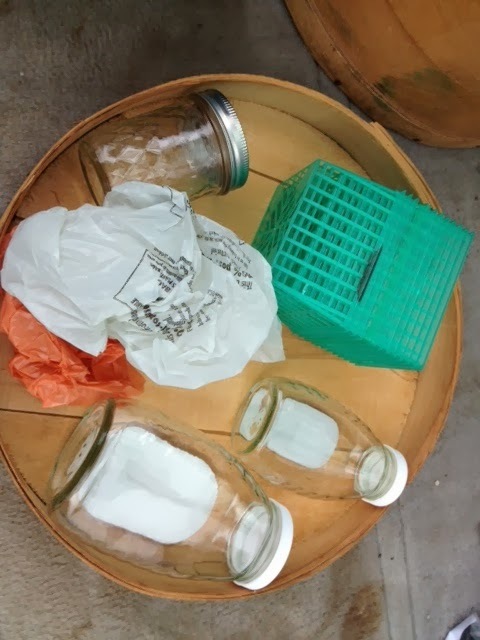 Personally, you can reuse a number of items - yogurt tubs, egg cartons, milk jugs - but at some point, your home is saturated and it is time to send your stuff back to whence it came - the grocery store or farmers' market! 1) Glass Milk Bottles: Many grocery stores now offer milk in glass bottles. Ours comes from a local organic farm so double win! You pay a deposit of $1 or so when you buy the milk but you get that money back when you return the empty milk bottle. 2) Glass Jars or Ceramic Crocks for Yogurt: Some grocery stores now offer yogurt in returnable glass jars or ceramic crocks. Like the milk bottles, these require a deposit up front that is returned when you return the container. 3) Glass Jars from Preserves: I have a few favorite farmers' market vendors with killer salsa or kimchee. They will happily take their jars back for reuse. Sometimes they will also offer a credit on future purchases. 4) Glass Honey Jars: Every beekeeper that I know will give you a credit on future purchases when you return your glass (not plastic!) honey jars. The credit, in my experience, ranges from $.50 to $1. 5) Plastic Berry Baskets: Our favorite berry farmers happily take back clean plastic strawberry baskets (the green ones). You can try the paper blackberry baskets but those will only work if they are spotless. Otherwise, toss them in the compost. 6) Egg Cartons: No farmer I have encountered will turn down clean egg cartons! I have seen people return ones to the original vendor as well return store-bought cartons. 7) Small Plastic Bags: I like to buy flowers at the farmers' market. It is good for the pollinators and pretties up the house. My favorite flower farmer told me that people bring her the plastic bags newspapers come in which she uses for wrapping wet flower stems. 8) Seed Trays or Nursery Pots: Every spring, our farmers' market bustles with herb and vegetable starts. Remember to return those trays and pots for the grower to reuse. 9) Wine Corks: Whole Foods and other grocery outlets (check the link) have wine cork collection barrels for ReCork, an organization that turns natural wine corks into new products. I keep a container in the trunk of my car for my reusable bags. It started out as a tacky plastic tub but I nabbed this vintage cheese box at an estate sale. It is large enough to house my shopping bags as well as all the items that go back to the grocery store or farmers' market for reuse. I have found that if I do not keep my produce bags separate, I will forget them. Now, I keep produce and bulk bin bags in a separate, smaller basket - also in the back of my trunk. After every shopping trip, I put the bags back in the correct place. When the milk runs out or the berry basket is empty, I stash them in my cheese box instead of letting them clutter up the counter. That way, whenever I hit the grocery store or farmers' market, I have everything I need. What other items do you return for reuse? How do you manage your reusables? Are you ready for rock star status? Hmmm, I wonder if my honey vendor wants their 6 pound glass jars back. I actually love them and use them for bulk storage of dry goods. I also like to take people soup in them, instead of plastic containers. I just hope they reuse them and don't recycle them. B/c we get our milk delivered, we stash our glass milk bottles in our delivery bins, which they pick up when they deliver the next ones (my deposit is WWAAAAYYY more than $1 per bottle btw). SPUD also takes plastic yogurt containers, cheese and chip and other snack wrappers for Terracycle, which is nice. I also return berry baskets and egg cartons to the farmers market after seeing Beth suggest it on her blog My Plastic-free Life. I wish I had thought of this blog title. I might pirate it someday. Great ideas as always, Green Bean! Wow, 6 lbs! Here is someone who likes their honey even more than me. ;-) Check with your vendor. I buy my honey from 3 different beekeepers (at farmers' markets) and they all tell me they reuse them, not recycle them. That is why they offer the refund. Interesting re the milk bottle deposits. I wonder if it is a SPUD thing? Mine is $1.25 I think. Anyway, love that SPUD takes back the cheese, yogurt, chip stuff. I saw their truck again. Need to look into them. Oh, and pirate the title away! :) We can have all kinds of "editions". Whole Foods charges a ton for Straus milk bottle deposits too. Close to $5, I think. These are such great suggestions! I bring a lot of bags and bottles with me when I shop at my local coop. I've never brought bottles to the farmer's market though. You explained so well that organizing all of these items is the key. If our household can have a place for these clean items, I'm happy to save some as I can. However, in a hurry, I admit single stream recycling is often the best we can do. I really like your suggestion for how to organize the reusables you want to return. Mine are just stashed in random places in the garage - which also makes it hard for me to remember to bring them back!